The Pepsi bottling plant, Varun Beverages, said to be one of the largest franchisees of PepsiCo outside the USA, experienced a number of grave issues, despite being under analogue surveillance. Its issues included everything from theft to operational inefficiencies by workers. Helping the company realise the shortcomings of analogue surveillance, VIVOTEK brought the plant up to par with the evolving security landscape. VIVOTEK, along with its partner, Network Technology, altered its analogue video surveillance solutions to IP surveillance solutions for improved video and image quality and enhanced Field of View (FOV). Commenting on the successful commissioning of the project, Sanjeev Gulati, country manager – India & SAARC, VIVOTEK, commented, “Despite their existing security surveillance arrangements, Varun Beverages suffered a number of thefts. Adding to their distress was the poor image quality and limited coverage area of their existing analogue surveillance solutions. Their daily operations suffered, owing to such drawbacks. After having analysed the situation; along with Network Technology, we suggested altering their analogue surveillance solution to IP surveillance solution. Adding to the technical insights; the video management software used to operate the IP surveillance solution is VIVOTEK VAST, which is connected to various camera models, including 5-megapixel 360-degree surround view fisheye camera FE8180, the Full-HD speed dome camera SD8363E, 3-megapixel outdoor-ready 180-degree view fisheye camera CC8370-HV, 2-megapixel 15-metre IR illuminator fixed dome camera FD8169, and two bullet-type cameras IB8369 and IB8367. The installers also segregated the camera for multiple site types on the basis of lens types such as fixed lens camera; vary-focal lens camera for different applications. 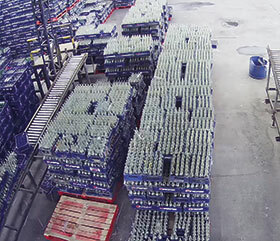 Post the deployment of IP surveillance, Varun Beverages managed to prevent thefts in the warehouses and plants. The workers and operation staff, being well aware of the enhanced security surveillance in the vicinity, now stick to the company protocols and live up to company standards in terms of hygiene and effective and efficient operations.